Lay on your back with your knees bent and place your feet behind an immovable object like a secure bar. An alternative is to have a partner hold your legs just below the calve muscles. 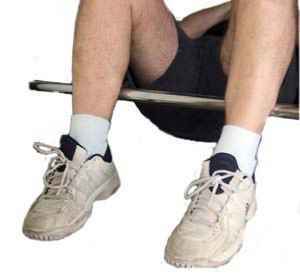 Your feet must be flat on the ground so that you can pull against the bar or partners hand. This movement will disengage the hip flexors from the sit-up movement. With your arms crossed over your chest, inhale as you use you abdominal muscles to sit up. When the resistance on the abdominal muscles slackens - about half way up -stop and exhale... Then inhale on the downward movement and repeat. Remember to pull with your legs against the resistance the entire time. You must coordinate pulling with your legs, proper breathing and contraction of the abdominal muscles for proper execution of this exercise. This is a very demanding exercise and isolates the abdominals... so you should not be able to perform many repetitions.